W M Birchall (American; b.1884). Watercolour, annotated HMS RENOWN 1935; and signed (LL). HMS RENOWN (Captain H R Sawbridge OBE RN) was one of the "running" battle cruisers of 1935: HMS HOOD (Captain F T B Tower OBE) was her running mate, HMS REPULSE was in major refit and would emerge a year later allowing RENOWN to go into dockyard hands for what transpired was a virtual rebuild; and HMS TIGER had paid off in 1931. 1935 had started badly for the Battle Cruiser Squadron (Rear Admiral S R Bailey CB CBE DSO). In January during exercises off NW Spain, she and HOOD were involved in a collison: RENOWN struck HOOD a heavy blow on her starboard quarter necessistating the latter's dry docking in Portsmouth for repairs and starboard propellor changes and the courts martial that inevitably followed helped no one's careers. But by the summer both ships had put this unpleasant incident behind them: 16th July was to be the day of King George V's Silver Jubilee Review at Spithead and both battle cruisers were to be anchored in the lines...... MP196 on this website offers an original watercolour by Frank Watson Wood of the 1935 Fleet Review. William Minshall Birchall was born in Iowa, America, in 1884 where he made a name as an illustrator and portrait artist before emigrating to England: here he settled on the south coast at Hastings. He has 5 watercolours hanging in the National Maritime Museum, Greenwich and a further 7 in the Peabody Museum, Salem. 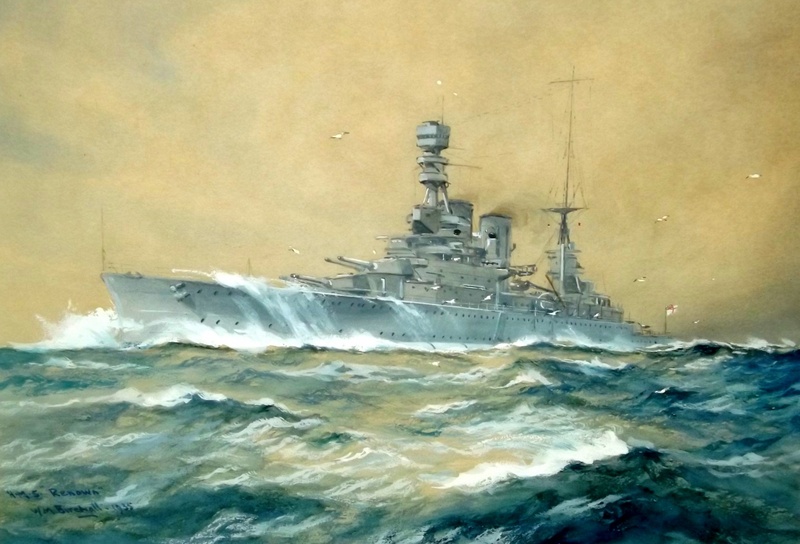 He invariably manages to add an atmosphere to his watercolours, this one being no exception as he portrays the huge battle cruiser driving through a moderate sea, her uniquely flared bows flinging the waves aside effortlessly.